description-2 = The Joint Strike Fighter (JSF) competition was intended to replace existing fighter, strike and ground attack aircraft for the US and allies. Boeing and Lockheed Martin provided design options, with the Boeing X-32 and the Lockheed Martin X-35. description-3 = The F-35 variants will roll off the Lockheed Martin production line at Fort Worth, Texas, and similar facilities located in Italy and Japan. It is projected that the global F-35 fleet will exceed 3,500, with the US the single largest operator, followed by Japan. description-4 = Australian industry has played a central role in the manufacture of the global F-35 fleet. This early commitment has seen more than 50 Australian companies participate in various stages of the F-35 program to date, across manufacturing, training, maintenance and sustainment, generating over $1 billion. description-5 = Defence set the key target for Australian industry participation in the F-35 program to between $6 billion and $9 billion of production and sustainment work through to 2050. Australian SMEs like RUAG Australia, Varley Group, Quickstep, Ferra and Marand provide components for every F-35 that rolls off the production lines around the world. description-6 = In early 2015, the US government assigned BAE Systems Australia (Williamtown) the regional F-35 airframe depot maintenance responsibility for the south Asia-Pacific region. In August 2017, BAE Systems Australia was also assigned the regional warehouse responsibility for the Asia-Pacific region. description-7 = TAE Aerospace will be responsible for the Asia-Pacific region Turbine Engine Maintenance Facility (TEMF), which will be based in in Bundamba, south-east Queensland. The Queensland facility will be responsible for deeper-level maintenance, where the F135 engine modules for all variants of the F-35 are disassembled, repaired and reassembled for testing. description-8 = Australian SME, Milskil will be responsible for providing next-generation aircrew training and support services. Based at Williamtown, Milskil has established itself as a key supporter of the RAAF's transition to a fifth-generation fighting force. description-9 = 2018 saw a 40 per cent increase in the production of the F-35 from 2017. In 2019, Lockheed Martin is set to deliver more than 130 F-35s, representing yet another 40 per cent increase in production. description-10 = Air Commodore Mike Kitcher, Commander Air Combat Group, describes Australia's F-35s as a "catalyst" changing the way the RAAF flies, fights and wins in the 21st century. "F-35 presents a quantum leap, not only in terms of operational realities, but also technologically. 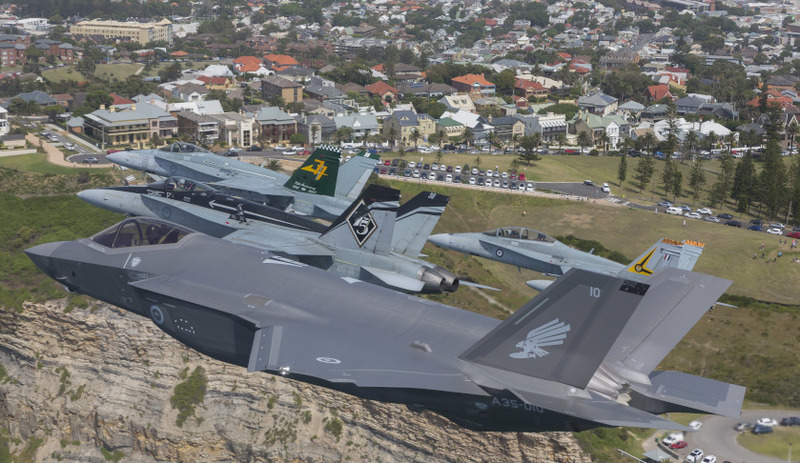 For Air Force in particular, but again also for the wider ADF, F-35 is a catalyst for developing a truly fifth-generation force," AIRCDRE Kitcher told Defence Connect. description-11 = Air Force expects that initial operating capability (IOC) for the F-35 to be delivered by 2020, which will see Australia operating two F-35 squadrons, No. 3 Squadron and No. 2 Operational Conversion Unit (2OCU), both of which will be based at RAAF Base Williamtown. Building on this, Kitcher said, it is expected that by end 2020, Australia will have between thirty and thirty-three F-35s in country. The F-35 program has been billed as the next generation of both Australia’s defence industry and air combat capability. Take a closer look at the story behind the story that is Australia’s F-35s. Ten nations are currently flying F-35s, including the US, UK, Italy, Norway, Israel and Japan. The first of Australia’s F-35A aircraft are now based on home soil after a period of training and development at Luke Air Force Base in Arizona, US, plus an epic Pacific Ocean crossing in December 2018. The Joint Strike Fighter (JSF) competition was intended to replace existing fighter, strike and ground attack aircraft for the US and allies. Boeing and Lockheed Martin provided design options, with the Boeing X-32 and the Lockheed Martin X-35. The F-35 variants will roll off the Lockheed Martin production line at Fort Worth, Texas, and similar facilities located in Italy and Japan. It is projected that the global F-35 fleet will exceed 3,500, with the US the single largest operator, followed by Japan. Defence set the key target for Australian industry participation in the F-35 program to between $6 billion and $9 billion of production and sustainment work through to 2050. Australian SMEs like RUAG Australia, Varley Group, Quickstep, Ferra and Marand provide components for every F-35 that rolls off the production lines around the world. TAE Aerospace will be responsible for the Asia-Pacific region Turbine Engine Maintenance Facility (TEMF), which will be based in in Bundamba, south-east Queensland. The Queensland facility will be responsible for deeper-level maintenance, where the F135 engine modules for all variants of the F-35 are disassembled, repaired and reassembled for testing. Australian SME, Milskil will be responsible for providing next-generation aircrew training and support services. Based at Williamtown, Milskil has established itself as a key supporter of the RAAF's transition to a fifth-generation fighting force. 2018 saw a 40 per cent increase in the production of the F-35 from 2017. In 2019, Lockheed Martin is set to deliver more than 130 F-35s, representing yet another 40 per cent increase in production. Air Commodore Mike Kitcher, Commander Air Combat Group, describes Australia's F-35s as a "catalyst" changing the way the RAAF flies, fights and wins in the 21st century. "F-35 presents a quantum leap, not only in terms of operational realities, but also technologically. For Air Force in particular, but again also for the wider ADF, F-35 is a catalyst for developing a truly fifth-generation force," AIRCDRE Kitcher told Defence Connect. Air Force expects that initial operating capability (IOC) for the F-35 to be delivered by 2020, which will see Australia operating two F-35 squadrons, No. 3 Squadron and No. 2 Operational Conversion Unit (2OCU), both of which will be based at RAAF Base Williamtown. Building on this, Kitcher said, it is expected that by end 2020, Australia will have between thirty and thirty-three F-35s in country.